DISTRIBUTE AND MANAGE sales team’s product, marketing or training content including videos, PDFs, presentations or other media. CONTENT DEPLOYED SECURELY TO MOBILE DEVICES and is instantly updateable. CREATE CUSTOM FORMS AND COLLECT INFORMATION FROM FIELD SALES FORCE including customer and sales information, competitive intelligence and data. INTEGRATES INTO YOUR BACKEND DATABASE or CRM including Sharepoint, Salesforce, SAP and Oracle. LET THE APP DO THE TALKING FOR YOU, with targeted messaging and notifications alerting them to specific content and urgent information. ACTIVITY STREAM, an easy-to-use forum for fostering sharing of ideas, queries, knowledge and expertise across the team. CONTINUOUSLY TRAIN the sales team while they are on the move. 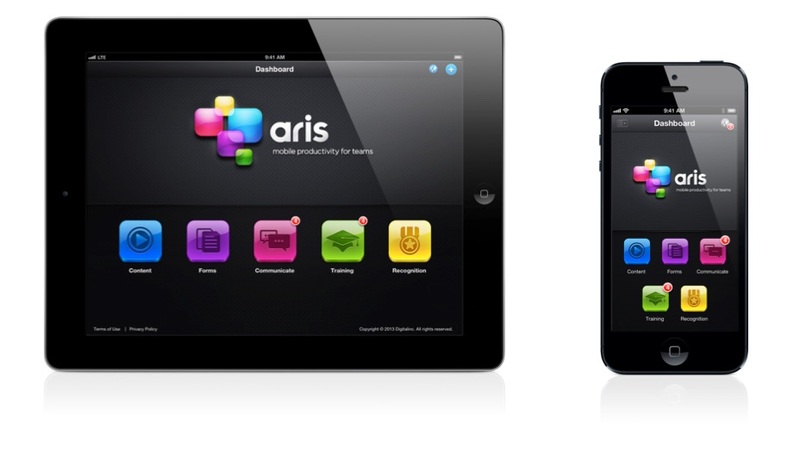 Deploy training materials via ARIS Content and make training more powerful by using quizzes. Select a mix of FINANCIAL AND NON-FINANCIAL REWARDS and recognition to drive an activity or outcome. Simple but powerful TECHNIQUES TO MOTIVATE SALES including leader boards, activity boards, status levels, congratulations messages etc.